As a small business owner, you should always be assessing if your organization is pursuing excellence. When you examine how most organizations run, rarely do you find excellence. Leaders espouse they are committed to delivering extraordinary products or service, but look under the hood of most businesses, and you will notice something quite different. What you discover are unclear strategies, inefficiencies, and employees who experience high levels of frustration and discontent. This can be especially true of small businesses where there are only a few employees wearing many hats. If a small business owner doesn’t model the way in the pursuit of excellence, it likely that his or her employees will underperform, and that business will suffer. Whether employees are referring to customer service issues, office politics or what they perceive as ineffective systems, they often experience an intense dissatisfaction with the way things are. Everyone knows processes could be more efficient and that co-workers could work together much more effectively. Unfortunately, superior productivity often eludes us. Why? Are you too busy? Are you letting things slide without calling attention to what matters most? Look up the word “excellence” in the dictionary, and you’ll see it defined as the quality of being outstanding or exceptionally good, exceeding ordinary standards, and continually improving. Excellence is what distinguishes great companies. Achieving organizational excellence is fundamental to creating highly functional and successful businesses, particularly those small businesses looking to grow. How do you begin to create a culture of excellence? Observe fans watching a professional football game. They demand excellence from their team; they demand excellence from every player on every play. They can’t tolerate poor performance. Neither can the players. That’s why they “huddle” between plays. Players give each other feedback and adjust in real-time. They constantly evaluate what’s working and not working then do things differently to improve their performance. They constantly reaffirm their commitment to excellence. This doesn’t happen in the workplace. At work, in our businesses, we often avoid addressing concerns directly. We ignore or overlook things. We don’t demand excellence from one another. Blame, avoidance, criticizing, and accepting the status quo is how we play the game. 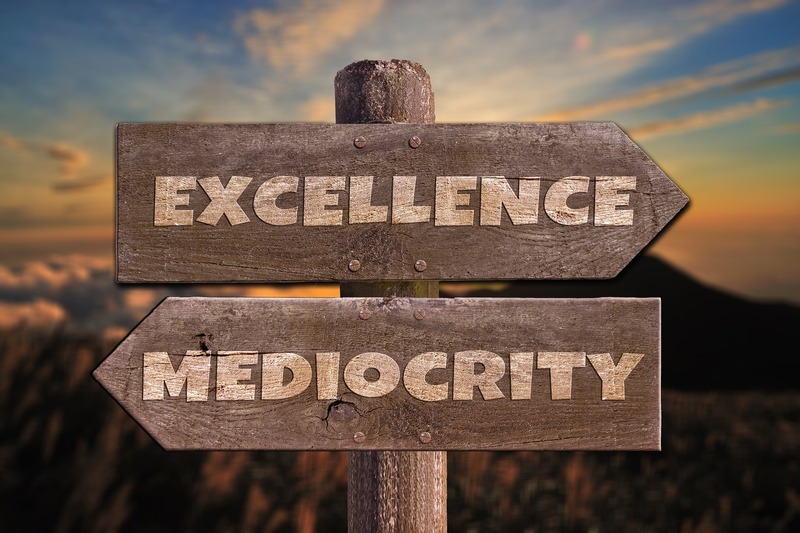 We tend to settle for mediocrity instead of demanding, pursuing, excellence. To change the game, start demanding excellence of yourself and others, including your co-workers. Creating a high-performance culture is not about being nice, it’s about being effective. This is a critical distinction you must make as a business owner if you truly want your company to excel. The key is to clearly define what excellence is and then start holding yourself and your employees accountable. Like the football game example, quickly address what needs to done differently and coach others to modify their behavior or alter processes for a better outcome. This is being effective. This is what demanding excellence looks like in action. If you’re unsure how to pursuit excellence in your business, find a small business mentor to help you establish this type of culture in your company. If you want a high-performance business, start demanding excellence of yourself and others. Settle for nothing less than the pursuit excellence. Do you need a strategic plan to achieve your goals and your excellence? Contact the Business Mentor Team today and schedule your appointment. Rich Murphy on Why Do Business Owners Need An Exit Strategy? Patty Hughes on Why Do Business Owners Need An Exit Strategy?